Got questions about Paruresis? Don't worry - we've got the answers! Is Paruresis a mental or physical condition? What are my chances of recovering fully? Should I tell others about my Paruresis? How many people suffer from Paruresis? Can changing my diet help in my recovery? Should I ask my Doctor about Paruresis? Does Paruresis put me at risk for health problems? I am a student at college, how can I recover? For diagnostic purposes, Paruresis is classified as a social phobia in the Diagnostic and Statistical Manual of Mental Disorders (DSM-IV 300.23). This does not mean you have a mental disorder as such, but rather a social phobia - in the same way that extreme shyness is a social phobia. The description given in the DSM classifies Paruresis as a Social Anxiety Disorder with contributing genetic, physiological, and environmental factors. There is growing evidence that anxiety has a genetic and physiological origin. I'm facing a urine drug test for employment, what can I do? If you know the test will be soon, get into a recovery program immediately. You may be able to provide a sample without any additional measures. Familiarize yourself with your legal rights. Private employers have a great deal of freedom to do as they wish consistent with the laws of their own state. Ask your doctor for instruction on how to use a catheter. Getting an independent test of hair, oral fluid, or blood may be an alternative to show that you are not using drugs. You must first get a medical screen to rule out any physiological or physical causes. Once you have determined it is Paruresis, dedicate yourself to finding a positive recovery program, like the Bashful Bladder program. Your recovery success is dependent on your willingness to dedicate time to the process. Recent studies on cognitive-behavioral therapy for social anxiety show that the highest recovery rates coincides with treatment includes cognitive restructuring, and substituting healthy thought patterns. Those with Paruresis usually hide their condition from others. However, finding support is essential to your recovery. The more those around you understand the condition and offer support, the more likely your anxiety about your condition will lessen and in turn make it easier to urinate. The National Comorbidity Survey is a survey of 8,098 people on the prevalence and types of various psychiatric disorders. In this survey, 6.6 percent of respondents noted that they experienced a fear of using a toilet away from home. In other studies, an average of 1 out of 12 people were found to suffer from Paruresis, either incidentally or consistently. That equates to 20 million people in the US. Paruresis is a complex disorder and is still being studied. Much evidence points to contributing factors of anxiety disorder and obsessive compulsive disorder (OCD). As always, good urinary tract system practices never hurt, so drinking more fluids will help to improve your health. Cranberry juice will help reduce or eliminate infections. Caffeine such as tea or coffee can stimulate urine production, but it should be used with caution as it can lead to anxiety and compound the problem. Little is known about the effects of alcohol in conjunction with Paruresis. Alcohol can relax the body and in turn the urinary sphincter, it also relaxes the bladder muscle which reduces the urge and ability to urinate. Until more is known, it is best to avoid alcohol as a solution, especially while in a therapy program. Urodynamic evaluation, (urinating into a special receptacle attached to the toilet that will measure the volume of urine expelled, the speed it was expelled, and the amount of time it takes. Cystoscopy, this allows an urologist look at the urethra and bladder from the inside. Talk to your doctor about your ability to urinate in different situations, your doctor may determine that the tests would be unnecessary. Once diagnosed, your doctor can provide you with a letter of diagnosis that can be kept on file with your employer to help avoid suspicion when the need for a drug tests arises as is the case with many employers in this day and age. Some men have reported having chronic prostatitis. Urinary tract infections, due holding urine longer, for both men and women. I am a student in high school or college, how can I recover? Talk to your parents, school nurse or school clinic about your Paruresis. Ask for their assistance in finding a therapy program that is right for you. Find others who have the same condition, join a support group the less you worry about your condition the more power you will have in finding recovery that will work for you. This website offers a course called "Bashful Bladder: How To Stop Paruresis in Seven Days" - which is a week-long program designed to help reduce your bladder shyness. 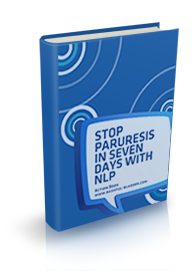 It uses Neuro-Linguistic Programming (or, NLP) to "reprogram" your mind to get rid of the mental block that causes paruresis. The course comes on two audio CDs, with a downloadable workbook in PDF format. It's the first of its kind, with phenomenal and life-changing results reported from users. It also comes with a full month-long guarantee, so you can try it out for yourself, and just return it if you're not thrilled with the results. To get started with your copy, for just $77, simply click here!